constructed mainly to the Broad Gauge of 5’-6” the widest in the world, in common with those of India and Pakistan. However, the loading gauge employed which dictates the profile of the rolling stock, is comparable to that of the Indian Metre Gauge. The first line to be built was the Main Line from Colombo to Kandy completed in 1867. The Coast Line to Matara was opened in 1895. The difficult extension of the Main Line to Badulla could not be completed till 1924. By 1928 railways had reached Kankesanturai on the Northern Line, Trincomalee and Batticaloa in the East and Puttalam and Talaimannar in the North-West. A Narrow Gauge 2’-6” line had also been laid on the Kelani Valley to Ratnapura in 1912 and between Nanu Oya and Nuwara Eliya in 1904. The current total track length is 1,508 km of Broad Gauge with no Narrow Gauge track. This paper traces the motive power development on the Broad Gauge. 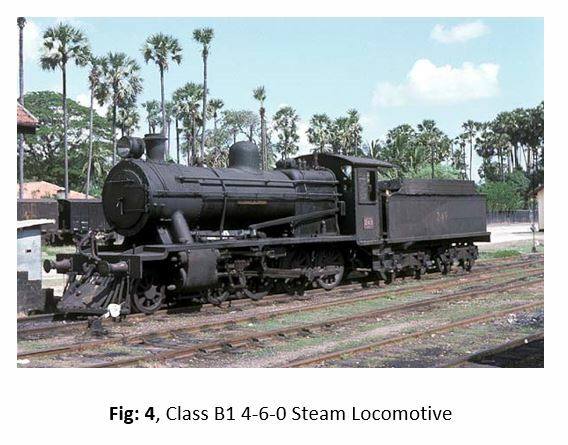 The earliest locomotives on the Ceylon Railways had been the ML (Main Line) Class steam locomotives of 4-4-0 wheel arrangement with inside cylinders (Refer Fig: 1). Imported from numerous locomotive builders such as Robert Stephenson, Kitson, Beyer Peacock and Dubs in the UK over the years 1864 to 1895, they had total weights of around 60 tons and nominal tractive efforts of about 9,417 lbf. However, within the Class different batches had significant differences between them in cylinder size and driving wheel diameter. 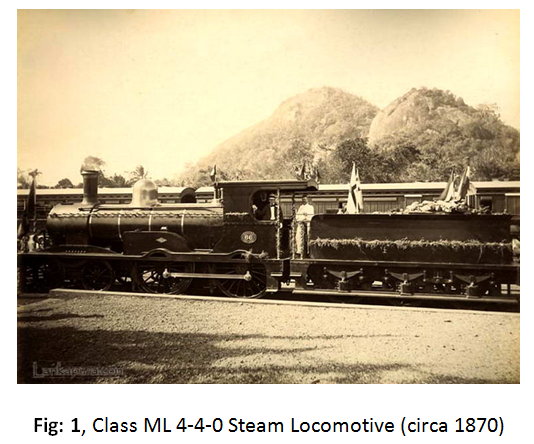 According to David Hyatt, the original locomotive No 1 “Leopold” an ML Class, had hauled the first ever train to run on the island between Colombo and Ambepussa in 1864. A more modern 4-4-0 was introduced beginning in 1911 prior to the opening of the Talaimannar Line known as the “Mannar” Class and which later formed the F1 and F2 Classes. The Class built by the Vulcan Foundry and North British Locomotive Works was equipped with square topped Belpaire fireboxes and outside cylinders with slide valves. Weighing a total of 80 tons with 17,336 lbf tractive effort they lasted well into the final days of steam until the late 1960s. Progress was made towards 6 and 8 driving wheel types culminating with the significantly successful NOA (“Nanu Oya”) Classes, later classified B1 to B6, the first batches of which were imported as early as 1883 and the last as late as 1948.
rs. As with earlier locomotives, several UK builders, namely Stephenson, Kitson, Neilson and the Vulcan Foundry supplied the Class. Hyatt indicates figures of approximately 85 tons as total weight and 22,620 lbf as tractive effort for the B2 to B6 Classes. From about 1915 superheated boilers came to be introduced in place of the earlier saturated steam boilers. The culmination in the ultimate development of the NOA Classes was the majestic B1 4-6-0s, the first batch of which arrived from famed Garratt builder Beyer, Peacock in 1927 (Refer Fig: 4). With Armstrong Whitworth and Stephenson delivering subsequent batches, the Class B1, many of which were named after British Governors of Ceylon, represented the finest and highly versatile steam locomotive type on the island. The most handsome of all steam Classes, they were the workhorses of the system hauling the fast expresses and heaviest goods trains in the steam era. With Belpaire fireboxes and Walschaerts motion, they weighed 98 tons in total and strangely, tractive efforts of only 22,620 lbf (in common with the tank-tender type 4-6-0s) with Load A rating are attributed to B1s despite their proven haulage prowess. Some were converted to oil-firing in the latter days of steam. Light axle load locomotives namely the Class B8 to B10 4-6-0s and Class A3 4-8-0s were imported from 1908 onwards for the originally lightly laid lines with 461/4 lb/yard rail to the North and the East to Batticaloa and Trincomalee. It is interesting to note that the Northern Line was re-laid with the standard 80 lb/yard rail by the early 1930s, but the Batticaloa and Trincomalee Lines remained unchanged till the late 1960s. These light locomotives came from builders such as Hunslet, Nasmyth Wilson and Bagnall. The highly successful A3 4-8-0s had axle loads as low as 9 tons for a total engine and tender weight of 86 tons and developed 20,266 lbf tractive effort. The latest of these 4-8-0s entered service as recently as 1951 and understandably, had relatively short working lives when steam working ceased by 1969. For shunting purposes, 0-4-0ST and 0-6-0T (later rebuilt as Class E1 0-6-2Ts locally) tank locomotives had been received beginning from 1869. These locomotives were obtained from different manufacturers in Britain such as Dubs and Hunslet and though intended mainly for shunting, were used for other duties as well. The railway also received an additional five 0-6-2T tanks from Robert Stephenson in 1928 to complement the shunting locomotive stocks. They weighed around 47 tons, had non-superheated boilers with tractive efforts of 18,014 lbs and were equipped with Stephenson inside valve gear. They lasted well into the end of the steam era some having spent their entire lives attached to important rail hubs. E1 Number 93, built in 1898 and which had been the oldest operational steam locomotive in Sri Lanka spending most of its life at Rambukkana, is now displayed at the Kadugannawa Rail Museum. For freight working on the heavily graded (1 in 44) Kadugannawa Incline on the Main Line to Kandy replete with 5 chain reverse curves, 0-6-0 locomotives had been obtained beginning from 1868, with one or two of them needed to bank the head-end unit. These were the original F Class and were withdrawn in 1912. 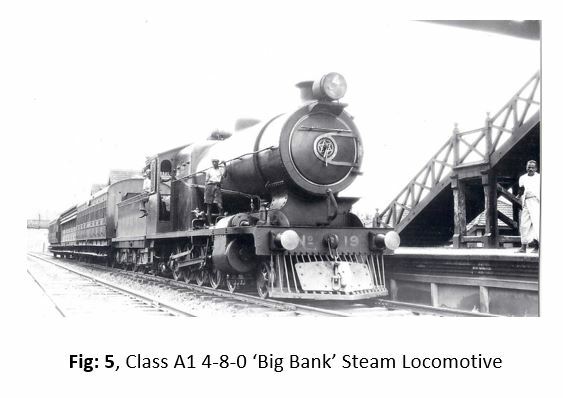 Over the years 1911 and 1922 for assisting trains on Kadugannawa Incline, powerful 4-8-0 type “Big Bank” locomotives were imported from Kitson (Refer Fig: 5). Weighing a massive 117 tons they boasted tractive efforts of 33,475 lbf and were based at Kadugannawa Shed. Originally non-superheated and with slide valves, all were later converted to superheating with piston valves. The need for twin locomotives on the Up-country Main Line was avoided with the introduction of the 2-6-2+2-6-2 Class C1 Garratt locomotives from 1928 onwards (Refer Fig: 6). Built by Beyer, Peacock of Manchester, who had an almost monopolistic control of Garratt building, they had tractive efforts of 41,078 lbf, the highest of any steam locomotive in Ceylon. Though weighing 128 tons, their axle loads were a low 131/2 tons. They were equipped with Hadfield power reversers, the first such introduction on a Garratt by Beyer, Peacock and Nicholson thermic syphons to enhance boiler heat transfer. Used always at the head end of trains on the incline, the Garratts were never operated as bankers lest their formidable tractive effort cause derailment through coupler over-run. Although later efforts at oil firing no doubt lessening the fireman’s chores, had some deleterious effects on the engine crew, the Garratts were the undisputed steam era Kings of the Hill Country, their thunderous and asynchronous four cylinder exhaust beat reverberating across the mountain sides. 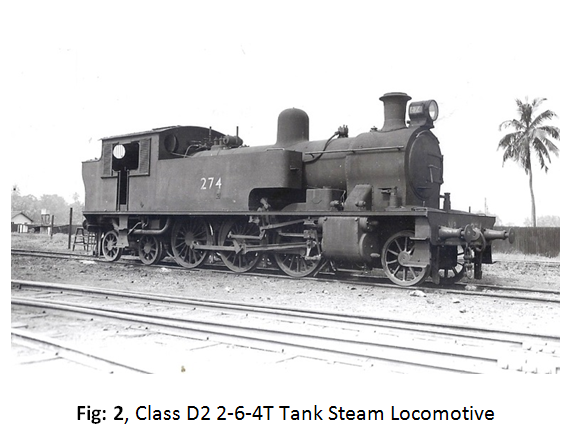 The rapidly increasing suburban passenger traffic in and around the Colombo area resulted in the Class D1/D2/D3 2-6-4T tank locomotives built by Stephenson and Hawthorn Leslie, being introduced from 1907 onwards for shuttle services with quick turn-around capability (Refer Fig 2). These powerful 75 ton tanks developed an impressive tractive effort of 21,275 lbf and their 5’ diameter driving wheels lent them the capability of rapid acceleration. Several were named after leading Colombo colleges. It was a common and impressive site in the early post-war years to see these formidable machines take in their stride fully loaded 14 coach suburban trains at speed. The arrival of diesel multiple units in the mid-1950s spelt the death knell for these fine engines after decades of dedicated service. A number of Sentinel and Clayton steam railcars classified R1 to R4 were also deployed for local passenger duties commencing from 1925. Most had vertical boilers, but a few were equipped with horizontal ones. 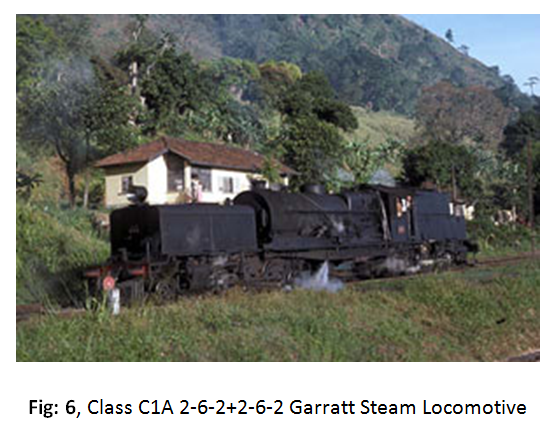 Remarkably, a few survived till the late 1950s being employed on the Matale Branch Line. Two were converted to diesel and were re-classified as Class T2. Sri Lanka was one of the first countries in the region to experience the convenience and haulage capabilities of diesel power on its railways. 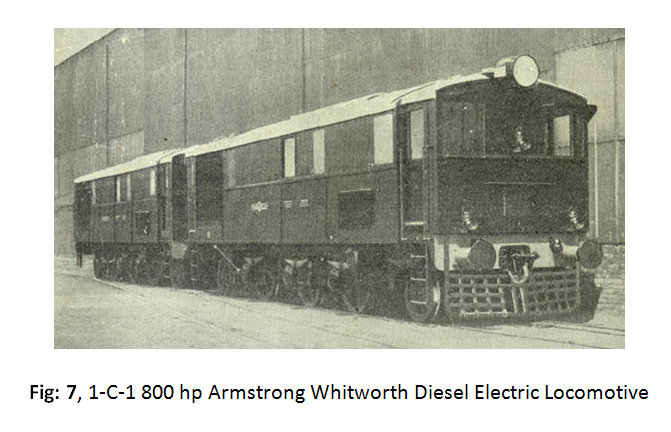 The country’s involvement with diesel traction dates back to 1935 when twin 1-C-1 type diesel electric locomotives with 800 hp Sulzer 8LD28 engines were loaned by Armstrong Whitworth of UK for trial running (Refer Fig: 7). These proved troublesome and were returned to the builders who later sold them to the Great Southern Railway of Argentina. In 1938 English Electric supplied three 4 coach diesel-electric multiple unit train sets with twin 180 hp Willans and Robinson engines which were used on the Coast Line providing passengers the experience of train travel with speed, comfort and cleanliness for the first time. These units were classed S1. Heavy corrosion from sea spray caused the sets to be withdrawn in 1955. Following the success of these units, English Electric provided several 180 hp rail cars (Class T1) in 1947 for operation, each coupled to a non-powered trailer car. Mention needs to be made of a 20 ton 116 hp diesel-electric shunter obtained from Armstrong Whitworth in 1934. Its entire life of over 60 years was spent at the Ratmalana Workshops prior to withdrawal in the 1990s and display at the Kadugannawa Rail Museum. The next diesels to arrive were the Class G2 54 ton 625 hp shunting locomotives with Bo-Bo wheel arrangement from the North British Locomotive Co in 1951, powered by Paxman 12RPHXL engines. The year 1953 saw the pioneering main line diesel electrics, the 1,000 hp Class M1 Brush-Bagnall locomotives in operation on the island’s railways (Refer Fig: 8). Equipped with de-rated Mirrlees JVS12T engines, the M1s of A1A-A1A wheel arrangement and of weight 88 tons, with 34,000 lbf starting and 25,000 lbf continuous tractive efforts, displayed some phenomenal haulage feats. These locomotives were to have a significant impact not just on the railways of Ceylon, but on the British diesel scene as well. 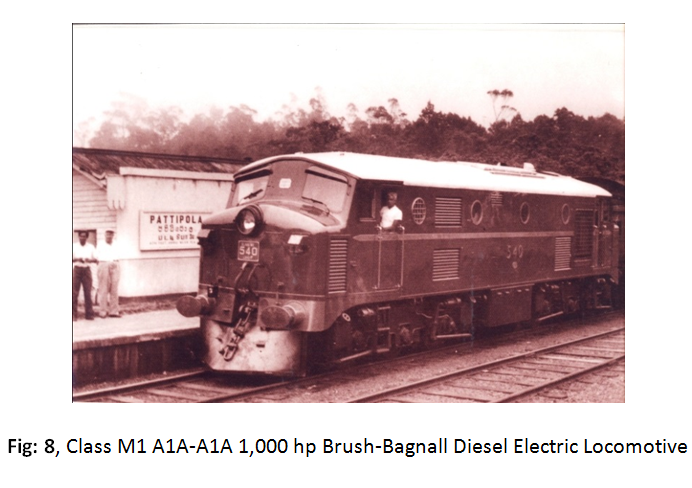 Despite the partnership of Brush-Bagnall never having produced a main line diesel locomotive before, the M1s after much initial teething problems, but thanks to the efforts of the Brush engineers and the ingenuity of that celebrated railwayman B D Rampala, settled down to accumulate some 30 million miles on the island’s railways before withdrawal in the early 1980s. Brush, on the strength of the units produced for Ceylon, later went on to become Britain’s most successful Diesel locomotive manufacturer. In 1954, the first batch of the legendary Class M2 General Motors (GM) Electro Motive Division (EMD) built locomotives of 1,425 hp was gifted by Canada (Refer Fig: 9). These were the export version G12 of that unrivalled machine, the GP7 produced by EMD for the North American market in the late 1940s. The first five locomotives arrived factory painted in two-tone orange and maroon livery, but later were re-painted locally in a striking three-tone scheme of silver, light blue and dark blue with a ‘smile’ at the ends. 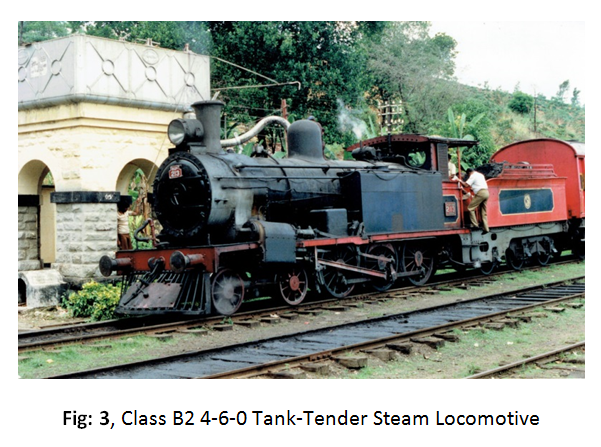 The Class powered by EMD’s fabled 12-567B two stroke engine and weighing 79 tons producing a starting tractive effort of 38,000 lbf, ultimately grew to 14 in total with the later units purchased by the Sri Lankan Railways. Of A1A-A1A wheel arrangement, two units were constructed as Bo-Bo, specially adapted to the Up-country Main Line. Thought by many to be the most reliable locomotive seen on Ceylon’s railways, all but one are said to be in service still after some sixty odd years, a tribute no doubt to the workmanship and quality of EMD, who dominated the world diesel locomotive scene for well-nigh sixty odd years. Mention needs to be made of two locally built diesel electric locomotives in 1956, the Class M3 of 360 hp, for shunting purposes. Each of these utilised twin engines from the withdrawn S1 Class diesel multiple units. 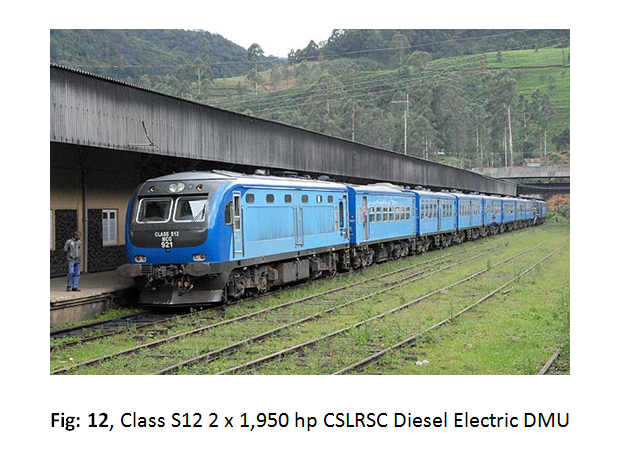 The suburban services around the Colombo area were dieselised with the importation of 45 diesel multiple units (DMUs) (‘power sets’ as termed in Sri Lanka) with hydraulic drive (Classes S2 to S4) from MAN in Germany and Schindler in Switzerland over the years 1956 to 1962. The S2 were powered by 800 hp Maybach MD435V8 engines while the S3 and S4 had 880 hp MAN V12 L12V18 and 1,000 hp MAN V12 L12V21 engines respectively. These four car DMUs with a power car at one end were capable of quick acceleration and rapid turn-around and coupled with Centralised Traffic Control immensely enhanced the commuter services in the region. The difficulty in keeping the still considerable steam fleet operating and the costs involved, caused the railway, in a somewhat hasty and later to be proved ill-conceived move, to import 60 diesel hydraulic locomotives in 1969, almost totally eliminating steam working. 45 of these (Class W1 of 1,200 hp) came from Henschel of West Germany and 15 (Class W2 of 1,600 hp) from VEB of East Germany, both Classes having high-revving British Paxman Valenta engines, 12YJXL in the W1s and 16YJXLs in the W2s. Sadly, all had working lives of little over 20 years. It is a proven fact in railway circles that diesel electric transmission is far superior to diesel hydraulics in terms of performance and longevity. Most countries of the world have opted in the main for electric transmission, except, not surprisingly, in Germany where Hermann Fottinger first designed a hydraulic transmission in 1905. A few W1s had been re-engined with Caterpillar diesels that appear to have extended their lives. A fleet of 28, 530 hp diesel hydraulic shunters (Class Y) with Rolls-Royce DV8 engines were obtained in 1969 from the famed builder Hunslet of UK to replace the G2s and the few remaining steam E1s. 1972 witnessed the unveiling of 8 locally built diesel hydraulic shunters (Class Y1) with 1,000 hp Paxman engines, a bold and if not, a commendable venture. The next few decades resulted in the Sri Lankan Railways, no doubt hastened by the poorly performing diesel hydraulics, procuring a multitude of diesel electric locomotives and multiple units of varying makes. Often the choice of locomotives had been dictated by availability of credit facilities and whims of donor countries, a choice not conducive to the appropriate type of machine suited for the required service being procured. The Canadian built MLW 1,750 hp Co-Co Class M4s arrived in 1975, the Japanese Hitachi 1,600 hp Bo-Bo Class M5s and German Henschel 1,650 hp A1A-A1A Class M6s in 1979 and the British Brush 1,000 hp Bo-Bo Class M7s in 1981. Theheavy 94 ton M4s were installed with the evergreen ALCO 12-251C3 engines while the M5s originally had MTU-Ikegai 12V652TD11 engines. The 66 ton M5s suffered from poor adhesion and unreliable power units and some were later re-engined with MTU V12M5B and Paxman Valenta 12YJXL engines. Both M6s and M7s had the renowned EMD engines, 12-645E in the M6s and 8-645E in the M7s. In 1996, the Indian firm DLW supplied eight 2,800 hp Co-Co ALCO locomotives (Class M8), based on the ALCOs which form the backbone of the vast Indian Railway diesel fleet. Fitted out with the obsolescent ALCO V16 251-B engine they weighed 112 tons with a length of 56’. Two of the Class were equipped with V12 2,200 hp engines and shorter bogies intended for the Up-country Main Line. However trials on that line had been unsuccessful. The Class M9 French built Alstom 100 ton Co-Co locomotives of 2,500 hp saw service in 2000 (Refer Fig: 10). Powered by Ruston 12RK215T engines de-rated from 3,200 hp, they were based on Alstom’s well-known ‘Prima’ range of AC drive locomotives. With starting tractive efforts approaching 60,000 lbf from their state-of-the-art AC drives, these highly sophisticated machines were soon rendered inoperative due to their need for exacting maintenance and exorbitant cost of spares, the harsh and dusty environment and somewhat lacking capabilities of the Sri Lankan railways contributing in no small measure to the sad state of affairs. A few of the locomotives are understood to be refurbished currently with assistance from the Arthur C Clerk Centre for Technology. 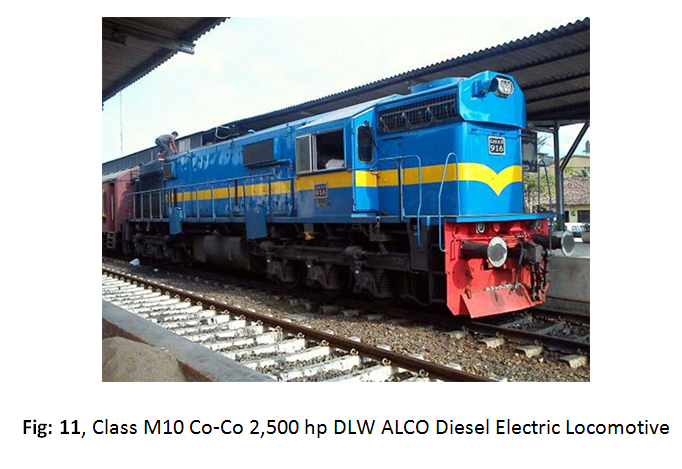 Beginning from 2012, DLW of India has also provided nine more ALCO Co-Co diesel electrics of 2,500 hp (Class M10) (Refer Fig: 11). At 117 tons and 61’ length, these are the heaviest and longest diesels to run on the island’s railways. The Class Y, M4, M6, M7, M8 and M10 have performed adequately and are the only classes still in regular operation, not forgetting the renowned EMD M2s which are into their seventh decade of operation. It is a compliment to the dedication of the railway personnel involved that such an ageing and assorted fleet can be kept afloat despite inadequacies of resources and funding. Nevertheless, it appears that the M2, M6 and M7 classes of advancing years are the only locomotives from the current operating fleet that are able to traverse the steep and curvaceous Up-country Main Line, the weight and wheelbase of the others precluding them from doing so. Further purchases of hydraulic drive DMUs (Classes S5 to S8) continued to be made for the commuter services between 1970 and 1991, this time all from Hitachi of Japan. Of these, only the Class S8 are still in operation. The S8s are powered by German MTU V12396TC13 engines of 1,413 hp. The railway’s penchant for hydraulic transmissions came to an end in 2000 when the Class S9 DMUs that came from the China South Locomotive and Rolling Stock Corporation (CSLRSC) were equipped with diesel electric transmission. With 1,580 hp MTU V12396TC14 engines and vestibule connections for the first time in DMUs, these six unit sets displayed swift acceleration and were a boon to the commuter services. 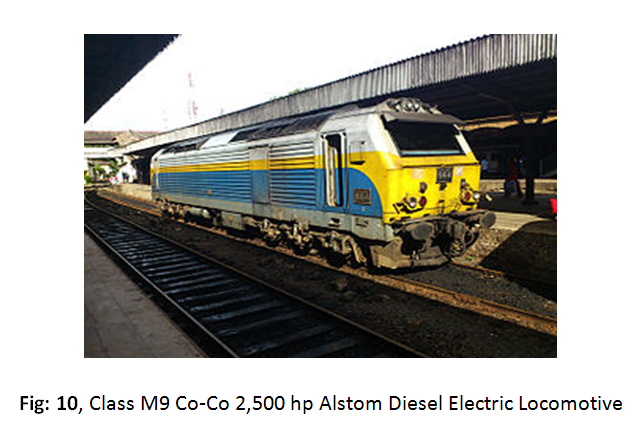 The Class S10 followed in 2008 from the same manufacturer with even more MTU power from V12 4000R41 engines of 1,950 hp. The S11 and S12 DMUs that were imported from India and China in 2011 and 2012 respectively marked a watershed in the annals of the Sri Lankan Railways’ operational protocols. These DMUs came equipped for long distance passenger operation, complete with vestibule connections, transverse seating, toilet facilities and air suspension. The Indian S11s have Cummins KTA50L V16 engines of 1,350 hp. The S12s manufactured by the China South Locomotive and Rolling Stock Corporation (CSLRSC) are powered by V12 4000R41 engines of 1,950 hp in common with the earlier S10s (Refer Fig: 12). A typical S12 long distance ten unit train consists of power cars at either end, grossing nearly 4,000 hp with air conditioned accommodation on 1st Class. Sadly it also spelt the death knell for most of the named locomotive hauled expresses, much loved by the travelling public, now replaced by these ubiquitous DMUs of unremarkable character. In recent years it appears the Sri Lankan Railways have faced a monumental struggle in attempting to maintain a scheduled and dependable regular service, despite the arrival of new rolling stock. Additional to concerns on rolling stock, despite much new track being laid to places such as the North, the existing track in most areas are in a parlous state, requiring speed restrictions and slow running with disruption to services. Neglect, mismanagement, lack of funding, skewed priorities have all contributed towards this unacceptable situation. It is reliably learnt that the railways are contemplating the purchase of a batch of new locomotives from that iconic builder EMD. 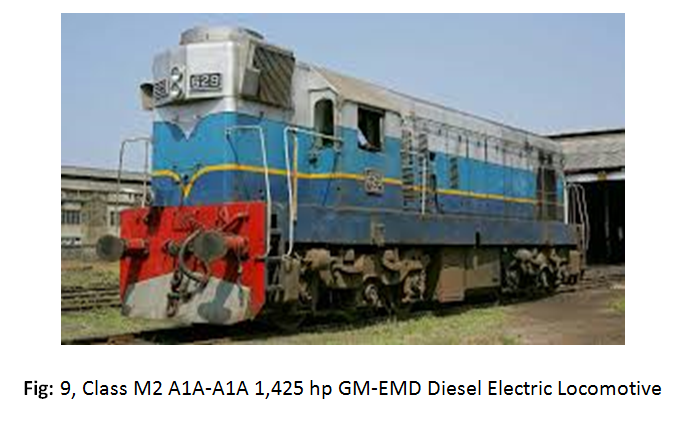 Though not of North American origin as in the case of the M2s, these locomotives are said to be EMDs (no longer GM owned, but now with Caterpillar) of Indian build. It is hoped the Up-country Line will once again reverberate to the familiar deep two stroke engine throb and echo of multi-chime horns of EMD locomotives and the new units will live up to the reliability and durability of that legendary moniker, breathing fresh life into the island’s ailing railways. Of course track rehabilitation too needs to keep pace if this is to be a reality.